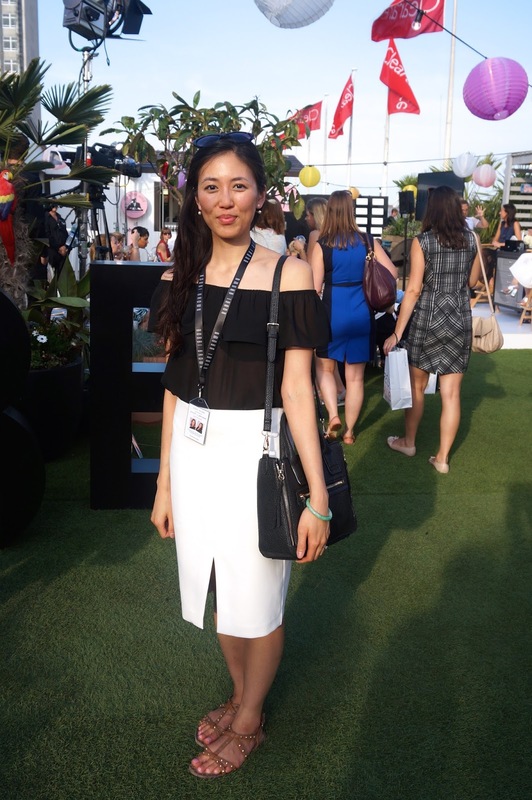 On one of the hottest days of the year in London last week, a group of beauty enthusiast descended on the roof garden at John Lewis department store for the Bobbi Brown Secret to Perfect Skin Masterclass. When I saw the event advertised and hosted by Stylist magazine, I knew I had to get a ticket! 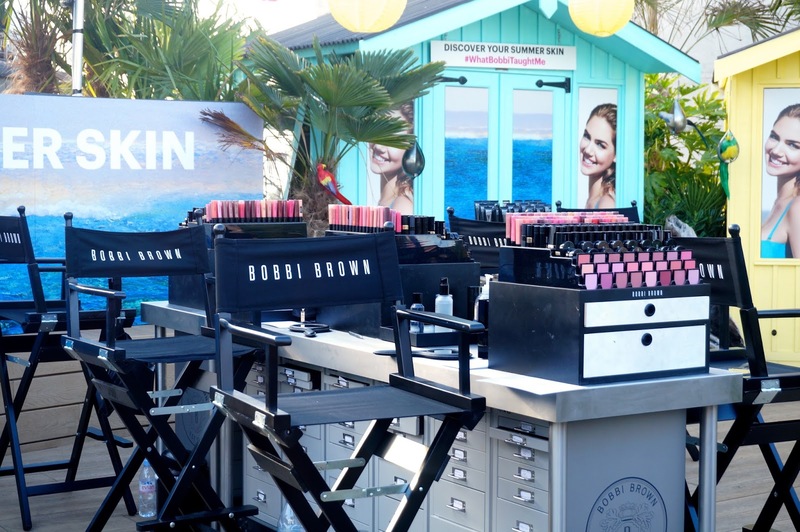 The roof top was adorned with all things Bobbi, refreshments stands and makeup stations - it was literally beauty heaven! The cute lanterns and beach huts was the perfect setting for a summer night of all things makeup. The weather was pretty intense and nothing I wore felt comfortable - you know that sticky feeling I'm talking about ladies! In the end I chose this sheer top from Boohoo and skirt from Mango. 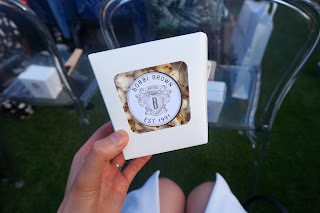 As we took our seats to watch the makeup masterclass, each of the chairs had a cute little box of popcorn and a fan - perfect to keep our cool in the heat. I was so hungry I ate all the popcorn! Also thankfully Joe & The Juice was there to quench our much needed thirst. I felt super lucky to be able to watch two of of Bobbi Brown pro makeup artists - Zara Findley and Hannah Martin create live makeup looks. 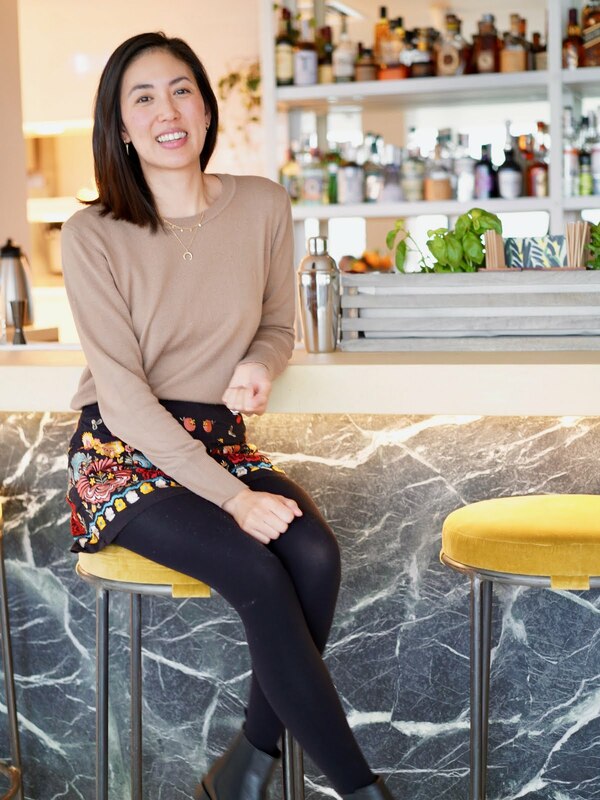 Hannah did a city makeup look for women on the go for Stylist magazine fashion editor and Zara did a bronzy summer beach look for John Lewis marketing manager. We all know good makeup is in the prep so Zara and Hannah used the hydrating gel cream on the ladies. It's super light weight and moisturising with in built primer - perfect for those long summer days. If you want to look instantly more awake and brighter, the ladies recommended the Bobbi Brown corrector (which you guys know I love!) It really lifts your under eye area and takes away any dark shadows. They also used their infamous foundation stick, it looks heavy but applies beautifully onto the skin, leaving a natural finish. It's so easy to touch up on the go with your fingers. I've had a makeover with this product before and my reaction when I saw my skin was wow! Seriously amazing product. They also used the BB cream, which is great to cover imperfections and even skin tone. If you want that bronzy summer glow - check out their pop rouge lip and cheeks, long wear cream shadow sticks for eyes and their shimmer bricks. To be honest all the products they used really enhanced the ladies features in a pretty and natural way! After my bridal makeover last month I knew I had to pick up their foundation stick and lipstick (Tulle) - both long lasting, which is a must for me. An event wouldn't be complete without a selfie station right? So I jumped in and made my first gif! It was a very inspiring evening - thank you to the Bobbi Brown team, Stylist magazine and John Lewis for a fab event! What's your favourite summer makeup looks? Woww this sounds and looks amazing! I love your outfit, so classic and perfect for summer! But i totally know that feeling of not feeling comfortable in anything when it's so hot. This is the second post I've read today about their Corrector being amazing, I'm thinking it's a sign that I need to invest! Haha this looks so fun! I remember seeing your instagram photos while I was at work still (:p boo) and I wished I was on a rooftop too! I love love Bobbi Brown, especially when all their stuff just looks so natural... Ooh and yes, I love the Joe & the Juice bar up there! I had the pineapple one and it was so yum! Oh man I want to go to a Bobbie Brown masterclass! That looks amaaazing! Jealous. And I love the gif; I made one my first one this week to show off my bouncy hair! such a fun event <3 love your outfits ! This looks like so much fun!! Love your blog!! What an awesome event to have attended! I've never tried Bobbi Brown before but I've heard great things about their makeup! Might have to go to the stores to pick a few things! Thanks for sharing!